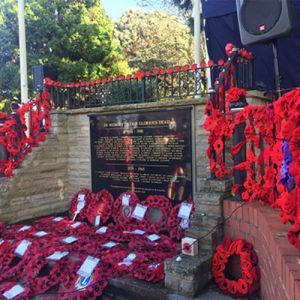 Thousands of local people turned out in 1921 when Westbury unveiled two war memorials to pay tribute to the men who had given their lives in what was then known as the Great War. 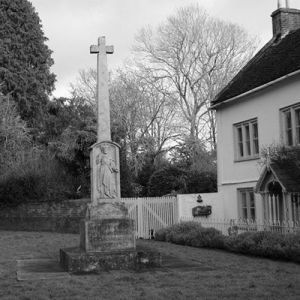 The town’s first memorial was erected in June 1921 in the churchyard of All Saints Church and it still stands there today. The inscription on the monument records the Great War as 1914-19 reflecting the fact that the actual date of the formal ending of the war was 28 June 1919 with the signing of the Treaty of Versailles. The following month – on Sunday 17 July – the war memorial in the Market Place was unveiled. The new memorial, which listed names of those killed in the war was a handsome obelisk made of Bath stone and surrounded by cast iron railings. This memorial continued to be used as the town’s gathering place for remembrance parades and services. By the 1970s, discussions were taking place about removing this memorial to make way for more car parking spaces and a new war memorial was commissioned and dedicated on 11 November 1974 in the grounds of Westbury House (the local library). The old memorial was removed the following year. The new memorial was later moved to its current place in Edward Street where it has been the regular venue for increasingly large crowds marking the annual Remembrance Day parade.